Claud Elliott Lake Park is one of three protected areas nestled along the upper Tsitika watershed. The area is part of a river system ranked among the 10 most important fish streams on Vancouver Island. Adjacent to the park along its western boundary is Claud Elliott Creek Ecological Reserve, which protects representative montane forest communities and critical deer and Roosevelt elk winter range. Two kilometers to the east is Mount Elliott Ecological Reserve, featuring a small, self contained sub-alpine drainage and hanging valley. This remote, undeveloped park has provincially significant conservation and recreational values that typify old-growth valley bottom forest and wetlands. The park contains two lakes – Claud Elliott Lake and Fickle Lake - which are both popular destinations for sport fishing and nature appreciation. Special Features: The park contains some interesting geological features related to an adjacent basalt pillar reserve. Large boulders and remnants of a large rock slide can be found at the northern end of the park, downstream of Fickle Lake. Access to this park is by active logging roads. The chance of encountering loaded logging trucks while traveling these roads is highly likely. Logging trucks have the right of way at all times. Drivers should use caution and yield to logging trucks, using pullouts whenever possible. Bring your own water, as potable water is not available in the park. All surface water must be boiled, filtered or treated prior to consumption. 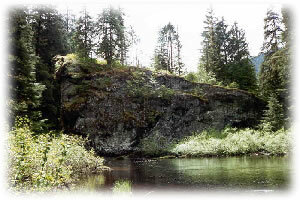 Claud Elliott Lake on northeastern Vancouver Island is located 8 km north of the Woss Camp turnoff, south of the community of Woss, and 50 km southeast of Port McNeill. The park is accessed via a well maintained gravel road connecting Canadian Forest Products Lukwa Main logging road and Highway 19. The chances of encountering loaded logging trucks while traveling the Lukwa Main and Elliott Main is highly likely. Vehicles may park just off Claude Elliott Main near the park boundary sign. From there, a 150-meter deactivated road leads to the Claude Elliott Lake trailhead. Drivers should be very cautious; logging trucks have the right of way. History/Cultural Heritage - Claud Elliott Lake Provincial Park lies with the traditional territory of the Tlowitsis and the Mumtagila First Nations. It was established as a park in 1995. Conservation - The park preserves and protects a wetland ecosystem within the ecological landscape of the Tsitika Valley. Claud Elliott Park contributes to representation of the Coastal Western Hemlock Biogeoclimatic variant gap in the Northern Island Mountain Ecosection. This area is part of a river system ranked among the 10 most important fish streams on Vancouver Island, providing protection for anadromous fish habitat. Wildlife - This park protects key fish and wildlife habitat for a variety of species associated with old-growth valley bottom lakes and wetlands. These include salmon, steelhead and a variety of trout. It is also an important habitat for Black-tailed deer, Roosevelt elk, wolves, cougars, black bears and waterfowl. Claud Elliott Lake, 1-km long, provides an ideal location for canoeing and kayaking. A short length of deactivated road and a short trail (walking time approximately 10 minutes) provides canoe, kayak and float tube access to the lake. Both Claud Elliott Lake and Fickle Lake are known for high quality recreational angling. Lakes contain coho salmon, Cutthroat, Dolly Varden, Kokanee and Rainbow trout and steelhead. The most easily accessible of these lakes is Claud Elliott Lake. More adventurous fishers can go to Fickle Lake, further downstream in the valley. This lake is harder to access and will require lining canoes or kayaks back upstream to Claud Elliott Lake. This park has a short, maintained access trail leading visitors down to Claud Elliott Lake; average walking time 10 minutes. This trail is suitable for transporting canoes, kayaks or float tubes down to the lake. Portions of this park are open to hunting for specific species. Hunters must have valid licences and tags. Please refer to the current Hunting & Trapping Regulations Synopsis. There is no designated swimming area at this park, however Claud Elliott Lake is suitable for swimming. There are no lifeguards on duty at provincial parks. Claud Elliott Lake Park offers good opportunities to view wildlife, such as black tailed deer, Roosevelt elk, black bears, bald eagles and a variety of birdlife. While fires are allowed, we encourage visitors to conserve the environment by minimizing the use of fire and using stoves instead. If you must use a campfire, please practice “Leave No Trace” camping ethics. “Leave No Trace” camping ethics. There are no maintained campsites at this park, however wilderness, backcountry or walk-in camping is allowed. No facilities are provided and there is no fee.